Sellers always want to get top dollar. They push for that. But there are signs that it is time to reduce the price of your home. I know you don’t ant to hear it, but it is true. There are not many showings – If agents are not scheduling showings there is a problem! Not having much activity is a solid indicator that something is wrong and it more than likely is the price. The first few weeks your home is listed should be the busiest. Buyers want to get out and view the newest listing right away so they don’t get bought by someone else. Buyers have seen the other homes available for sale already. Remember today’s buyer has access to everything online and is very educated on home values. It is important you price your home properly. Shooting for the stars will shoot you in the foot. 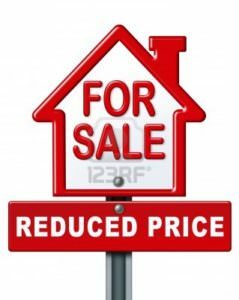 Don’t overprice a dated house….buyers know. Lots of attention, no offers – The opposite may be true, lots of lookers no offers. Your home may be really appealing in a lot of ways, but if the price isn’t right buyers will purchase elsewhere. Once again, the buyer is savvy. You are running out of time – In some circumstances there may be a need to sell a home quickly. There are plenty of situations where selling as soon as possible is a goal. If you have a specific need to sell quickly due to some future event it is probably better to reduce sooner rather than later. The house is dated/in need of repair – Some homeowners have not done much to their homes over the years. There may be major updates needed. Maybe you have dated bathrooms, kitchen, a heating system on the way out, an old roof. Maybe you have unique colors on the walls. Buyers will notice and adjust what they believe your home is worth. You need to be aware and adjust.